or a particular area of professional interest. Within the College structure will be smaller CAT (Creative Arts Therapists) Groups which may be a sub-group of a College; or operate as a stand-alone group. Each College will be autonomous and will elect a Leadership Group. A representative of that Group will be invited to sit on the Advisory Group that liaises with the Board. It is envisaged that the existing ANZATA Regional Groups and ACATA CATs in Conversation groups will continue in this new structure as CAT Groups. They can have their own name and continue to meet and operate autonomously as they have done. There will be processes for existing groups to be eligible to apply for funding for their activities and events, and for new groups to get established. Strategies will be developed to support the current Groups to blend into the new College and CAT Group structure. 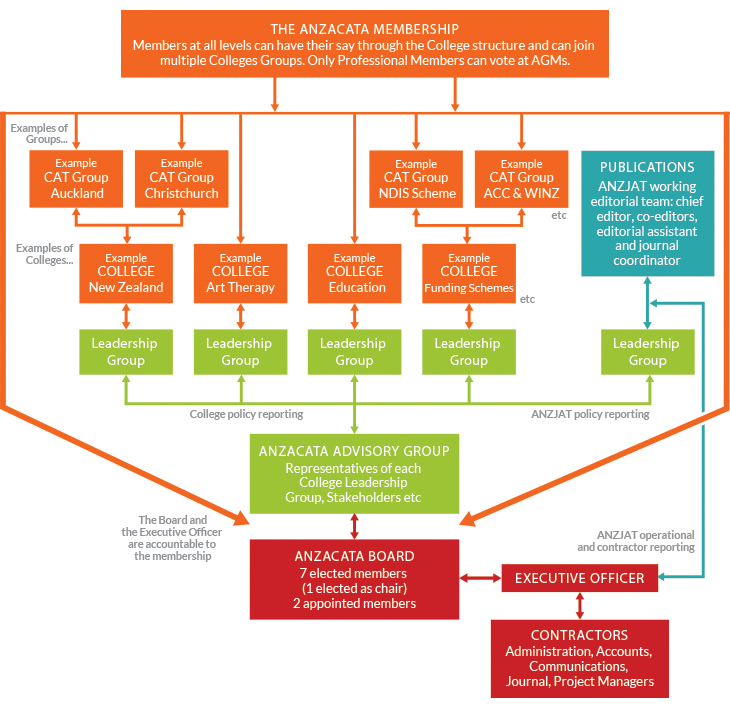 ANZACATA envisages that through this process, these groups will enjoy more opportunities to connect with other Groups and Colleges. Members of all levels can join Colleges and CAT Groups, and will be able to belong to multiple Colleges and/or CAT Groups.